Looking at margins and debt alone, Cliffs Natural Resources is going to have a very challenging time competing with the likes of BHP Billiton, Vale, and others. After looking at Cliffs Natural Resources' (NYSE:CLF) position vis-a-vis its competitors, it is clear that long-term investors need to tread very carefully. Due to China's inability to consume whatever producers bring to market, Cliffs Natural Resources' future has even more challenges involved. Money is really a form of power. For each dollar of sales a company with higher margins has more produces more profits, and thus power. In turn a company with more power has an easier time dealing with unruly markets. It is able to produce more stable profits and deserves a higher valuation. When compared to other big iron ore producers like BHP Billiton (NYSE:BHP) and Vale (NYSE:VALE), Cliffs Natural Resources clearly faces margin pressure. This means that during the coming years of increased iron ore oversupply and decreased Chinese steel demand, Cliffs Natural Resources will have less power at its disposal to improve operations and maintain margins. The bigger iron ore producers are more diversified than Cliffs Natural Resources, so it is helpful to look at their segmented margins to get a clearer picture. BHP Billiton's recent financial results for the half year ending in 2013 show that its iron ore underlying earnings before interest and taxes margin was a fat 59.1%. This is far above the 15.8% EBIT margin before special charges Cliffs Natural Resources posted in the same time period. Even if you combine BHP Billiton's coal and iron ore segments, its aggregate EBIT margin of 44.5% is substantially higher than Cliffs' EBIT margin. Vale's first-quarter 2014 statement shows that after accounting for normal costs of production and depreciation, depletion, and amortization (DD&A), its iron ore segment produced $2.45 billion of operating income on $5.18 billion of net operating revenue. Cliffs Natural Resources, on the other hand, produced $63.2 million in income after operating expenses and DD&A on $940 million in revenue. Clearly Vale has the upper hand with more power to achieve its goals. While it may appear that Rio Tinto (NYSE:RIO) and Cliffs Natural Resources are on equal footing, the reality is not as rosy. 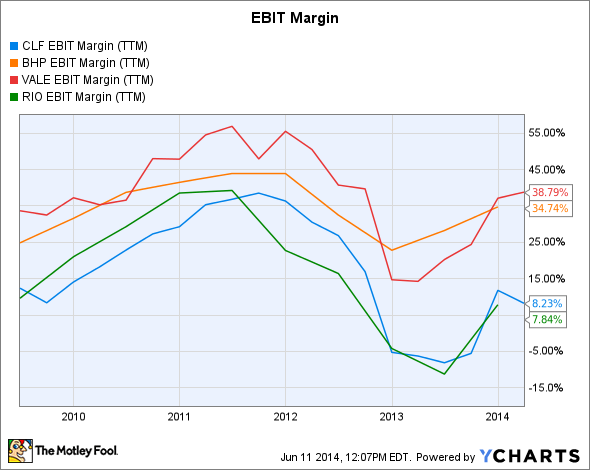 Cliffs' 2013 EBIT margin was 15.1%. Meanwhile Rio Tinto's 2013 comparable iron ore margin was 60.8%. Special charges and other income compressed Rio Tinto's EBIT such that it hides the strength of its continued iron ore operations. Cliffs Natural Resources' cost structure leaves much to be desired, and its debt load also holds risks. Of the $4.89 billion face value of its total debt it had at the end of Q1 2014, a significant portion is due before 2020. Its $1.75 billion revolving credit facility is due to mature in 2017, and a $500 million fixed bond issue is due in 2018. The good news is that only $175 million was drawn on the revolving loan as of Q1 2014. To ensure that Cliffs' debt does not get out of control, this revolving credit facility will need to be carefully watched. The reality is that Cliffs Natural Resources is stuck in a long-term battle with fierce, diversified, high-margin competitors like BHP Billiton and Vale. Cliffs Natural Resources' bond issues are pushed out far enough that they do not pose any immediate danger, but its revolving credit facility will need to be rolled over in the coming years.